Two of my closest friends, Mallory and Josh Ebrahemi, brought me to my first SoulCycle class in Santa Monica, taught by Sunny. They had ranted about how awesome class was and how much they thought I would enjoy it. I booked a bike in the front row because I like to see the instructor when I take a class and had no idea what I was getting myself into. I don't remember a single song she played, but I do remember that she looked at me in the middle of class and said, "This can't be your first class." I grinned from ear to ear, had the time of my life and took in all the positive energy the room had to offer. I continued to take a few instructors here and there in between my busy dance schedule. Then I discovered Lindsay Buckley, y'all. She changed my SoulCycle world instantly. The first class I took with her was old school hip-hop and from that point forward, I was hooked. A few months later, I was auditioning for a new show in Vegas and received a text from Lindsay. She said that SOUL was looking for new instructors and wanted to know if I’d consider trying out. At that time, I was working as a professional dancer and a barre instructor. 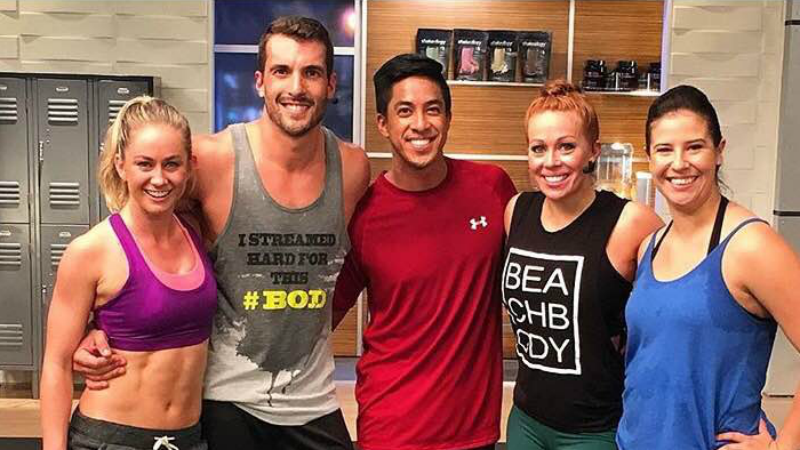 My plate was more than full, but to me, SoulCycle was both of my passions in one – dance and fitness -- so I knew I had to get involved. I immediately jumped on board and auditioned. I couldn't pass up an opportunity like this! My path to teaching in Newport Beach and Manhattan Beach began, interestingly enough, with my love of dance and fashion. I grew up in South Carolina, but as a dancer, I’d been visiting LA every summer since I was 12 years old to train and compete in nationals. I instantly feel in love with the city and thought to myself, this is where I want to live my life. After graduating from high school, I tried to convince my parents that I was moving to LA to pursue my dance career. Yeah... let’s say that didn't work out so well. Luckily, I also had a huge interest in fashion. I worked closely with the seamstress that created all of our dance costumes and also won Best Dressed in high school. My amazing friend, Chad McCall, told me about the Fashion Institute and Design and Merchandise in LA. That became my "in" to California and I decided to attend FIDM and still dance on the side. After graduating with my apparel manufacturing degree, I worked in the fashion industry for three years. I then decided to continue to pursue dance while my body would still allow me to do so. The biggest adjustment for me when moving across country was being away from my family. It was hard not seeing them as often as I wanted to and sometimes not being able to talk because of the time difference. Also, everyone moves at a lot faster pace here than they do in good ‘ole Easley, South Carolina. I was used to tractor-trailers and cow pastures. Sure, I'd visited numerous times, but it’s different actually living in a huge city than a small town. Honk! Honk! Since becoming an instructor at SoulCycle, my body has transformed. I have always been active with dance and other fitness workouts, but teaching 12 classes a week has definitely toned my body more than ever. My home studio is Manhattan Beach. I had the awesome opportunity to be a part of the opening of this studio and it feels like home every time I walk in. The special and humble humans that work at this studio are so easy to get along with and make my job that much more enjoyable. There's not a day I walk into work and don't leave without my cheeks hurting from smiling and laughing with the employees and riders. It’s positive and chill vibes all around!! Do you have a SOUL Story to share? Email SOULlife@soul-cycle.com! Want to ride at SOUL? Grab a series HERE then book a bike!